Areca nut, the seed of Arecacatechu is the fourth most common addictive substance in this world. It is primarily consumed in South-East Asia, Taiwan and Papua New Guinea and is a leading cause of oral cancers in these regions. In India, areca nut is consumed in many forms such as pan masala (PM), betel quid, gutka, etc., and has become a part of the lifestyle in many rural and urban areas. As opposed to betel quid, PM is a dehydrated, nonperishable preparation of areca nut, catechu (Acaciacatechu), slaked lime (Calcium oxide and calcium hydroxide), cardamom and many artificial perfuming and flavoring substances. It is being extensively used by the young people due to the marketing and promotion tactics of the industry targeting them and false claims about their safety. Its popularity is also due to its packaging in small sachets that are cheap, widely available and easy to carry. Even women have become habituated to PM and it is considered a status symbol to carry its sachets and offer it to one's social contacts. Areca nut and betel quid even without tobacco are carcinogenic and addictive substances having systemic and far reaching effects on the human body. The aim of this article is to review the effects of PM on all the major organs the human body and assess its mutagenic and carcinogenic potential. The adverse effects of areca nut on the human body have already been highlighted in a previous publication. In this review article, we have restricted to articles that have evaluated harmful effects of PM that possesses many additives in addition to areca nut. A search of the relevant literature was done in PubMed, Medline and Cochrane databases of articles using various combinations of the following key words. ”Pan masala,” “public policy,” “carcinogen” and “toxicology.” Articles published till December 2014 were included in the literature search. Search with key word “Pan Masala” yielded 79 articles, “pan masala” and “public policy” yielded 3 articles, “pan masala” and “carcinogen” yielded 4 articles, “pan masala” and “toxicology” yielded 6 articles. Only studies that considered PM as a mixture of areca nut, catechu, lime and other flavoring substances were included in the study and the studies using tobacco in this mixture were excluded. Totally, 36 articles that met these criteria were used eventually. 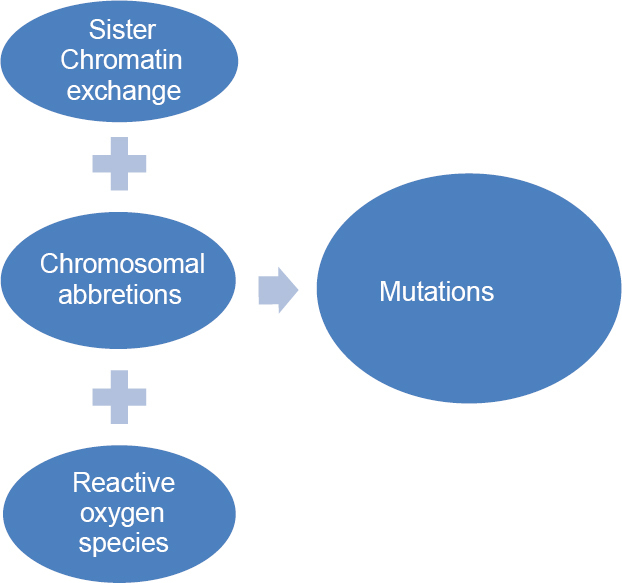 The mutagenic and genotoxic potential of PM and its main constituents are assessed through many studies [summarized in [Figure 1].In vitro studies using aqueous extract of PM on Chinese hamster ovaries (CHO) have shown that there is elevation in sister chromatin exchange (SCE), chromosomal aberration (CA) and micronucleated cells (MN).,, Studies in male mice using aqueous suspension of PM have shown increased X-Y univalent frequency, sperm head abnormalities and significant delay in cell cycle progression., The increased production of superoxide ions led to increased lipid peroxidation, DNA fragmentation and triggered apoptotic cell death which was similar to tobacco containing products. Mice fed on diet containing PM showed that the percentage of micronuclei in polychromatic and normochromatic erythrocytes was 0.42–1.66 and 0.30–0.74 respectively with respect to the controls 0.42 and 0.30 respectively. Of the several ingredients of PM, areca nut is a proven carcinogen and catechu, lime may have carcinogenic potential. PM mixture contains nitrosamines, polycyclic aromatic hydrocarbons, residual pesticides and toxic metals like lead, cadmium, nickel., Areca nut contains various alkaloids (arecoline, arecaidine, guvacine, guvacoline) which lead to formation of nitrosamines in the saliva. Two of these nitrosamines are accepted as carcinogenic in animal studies. Out of which 3-(methyl-N-nitrosamino) propionitrile (MNPN) is the most carcinogenic [Figure 2]. There is enhanced nitrosation of amines present in areca nut in people with poor oral hygiene due to greater formation of nitrite and bacterial enzyme mediated reactions. MNPN leads to the formation of O 6− MeG adducts, thus leading to G→A transition following DNA replication. Slaked lime or calcium hydroxide leads to the formation of reactive oxygen species (ROS) in presence of areca nut and causes oxidative damage to DNA. Catechu induces SCE and dominant lethal mutation. In combination with lime and areca nut, it also leads to formation of ROS. Heavy metals such as iron and copper that are found in areca nut lead to increased production of ROS as they act as catalyst in the reaction., ROS oxidizes DNA bases, e.g., deoxyguanosine to yield 8-oxo-dG that promotes tumor formation in oral cavity. Tender areca nut causes more 8-oxo-dG formation in DNA than the ripe variant. An in vitro study had shown that areca nut extract increased expression of COX-2 and prostaglandin production in human oral mucosa cells which aids in carcinogenesis. The frequency of CA (0.86–3.36), SCE (3.61–6.64) and MN (0.104–0.656) increases with the number of pouches consumed every day and age of the subject. People with increase CA have 2 times more chances of developing cancer. PM users do not spit the juice which leads to carcinogenic effects not only at oral cavity but at other sites too. Studies in Swiss mice had shown that neoplastic lesions were most common in lung, liver, stomach and rarely in prostate, testis, skin. The most common malignant tumor seen was lung adenocarcinoma with statistically significant dose response relationship. A study using aqueous extract of areca nut and alcohol on CHO cells had shown elevation in CA frequency as compared to when they were used alone. Thus, alcohol consumption may increase the risk of oral cancer in PM chewers. Areca nut, the main constituent in PM, is the major causative agent for oral sub-mucous fibrosis (OSMF). As compared to betel quid chewers developing OSMF in 9.5 years, 75% PM users develop it within 4.5 years. It may be partly due to higher proportionate dry weight of areca nut in PM compared to betel quid. The relative risk of developing OSMF in PM users as compared to nonusers is 498. As compared to users of tobacco without any visible oral lesion, the relative risk of oral cancer in a subject with OMSF is 397.3. The rate of transformation of OSMF to oral cancer varies from 4.5% to 7.6%, and this is mainly responsible for an increase in oral cancer in young subjects. The duration was also shorter in the subjects who have higher frequency of use per day and daily consumption was more important than the total duration for development of OSMF. The abrasive nature of areca nut is responsible for local trauma and injury to the oral mucosa which is more severe with the use of PM due to the granular nature.In vivo study in albino rats had shown that PM use lead to increased keratoses, parakeratoses, inflammatory cell infiltrate with loss of nuclear polarity leading to increased sub mucosal collagen deposition. Copper which is found in PM in large quantity up-regulates collagen synthesis and increased cross-linkage of elastins and collagens. OSMF is caused by decreased fibroblastic phagocytosis of collagen, interference with lysyl oxidase, matrix metalloproteinases and increased secretion of growth factors, inflammatory cytokines. A study conducted at a de-addiction center in Chennai showed that most of the PM users had characteristics features of substance abuse comprising tolerance that developed in 2–3 months, craving and substance seeking behavior. Within 2–3 hours of abstinence, the subjects developed withdrawal symptoms comprised anxiety, restlessness, tremors, loss of appetite, body pains, insomnia, lacrimation, giddiness, breathlessness, vomiting and intense craving. Few withdrawal symptoms mimicked opiate withdrawal. Three out of four patients with addiction were successfully treated using benzodiazepines. An in vitro study in CHO had shown that short-term treatment with alpha-tocopherol (AT) decreased the frequency of CA in cells treated with PM extracts. Continuous treatment with AT resulted in statistically significant reduction in CA frequency. In another study, CHO cells, when treated with beta-carotene and retinoic acid showed decreased frequency of SCE and CA in cells treated with PM extracts which was more pronounced on continuous treatment. Pan masala use is rampant in India by all the sections and age groups of the society. It has emerged as a major cause of oral cancer in India. National Family Health Survey-2 showed that 21% of people over 15 years of age consumed PM or tobacco. Study in the state of Tamil Nadu showed that the age at which people start consuming areca nut products ranges from 12 to 70 years. 58% of the subjects chewed the products more than twice a day. Advertising tobacco products including PM containing tobacco is banned in India since May 1, 2004. To bypass this ban tobacco companies are advertising PM ostensibly without tobacco, heavily in all forms of media. PM is surrogate for tobacco products as the money spent on marketing, and advertising is many times of the revenue generated from the sale of PM. In Mumbai after the ban on PM and gutka the sale has come down and the percentage of users quitting and reducing the habit was 23.53% and 55.88% respectively. The main reason of quitting and reduction in consumption was nonavailability of these products. In spite of the ban gutka was still available but in different forms or at increased cost., Strict law in the form of cigarettes and other tobacco products act 2003 has been made in India, but the enforcement and compliance is lax. There is a need for strong enforcement and compliance of laws throughout the country. The genotoxic, carcinogenic properties and numerous other harmful effects of PM need immediate and strict action by the government on PM without tobacco as it has banned PM with tobacco. The consumers should also be made aware of the harmful effects of PM as they are under a false impression that it is not harmful. Pan masala is widely used across all the strata of society and is freely available in many parts of the country. It is carcinogenic, genotoxic, and has harmful effects on the oral cavity, liver, kidneys and reproductive organs. Government action is immediately required to restrict the consumption and to make the people aware about its harmful effects. Dr. Prakash C. Gupta Dsc. Director of Healis-Sekhsaria institute of public health, Navi Mumbai for his extremely valuable suggestions and help in editing the manuscript. Dr. Arunee Garg MDS for her valuable help in editing the manuscript. Ray CS, Gupta PC, Beyer J. Research on tobacco in India including betel quid and areca nut. Available from: http://www.actindia.org/databases.html. [Last accessed on 2014 Mar 25]. Reddy KS, Gupta PC. Report on Tobacco Control in India. New Delhi: Ministry of Health and Family Welfare, India; 2004. Garg A, Chaturvedi P, Gupta PC. A review of the systemic adverse effects of areca nut or betel nut. Indian J Med Paediatr Oncol 2014;35:3-9. Adhvaryu SG, Dave BJ, Trivedi AH. An in vitro assessment of the genotoxic potential of pan masalas. Indian J Med Res 1989;90:131-4. Jaju RJ, Patel RK, Bakshi SR, Trivedi AH, Dave BJ, Adhvaryu SG. Chromosome damaging effects of pan masala. Cancer Lett 1992;65:221-6. Patel RK, Jaju RJ, Bakshi SR, Trivedi AH, Dave BJ, Adhvaryu SG. Pan masala – A genotoxic menace. Mutat Res 1994;320:245-9. Mukherjee A, Giri AK. Sister chromatid exchange induced by 'pan masala' (a betel quid ingredient) in male mice in vivo. Food Chem Toxicol 1991;29:401-3. Mukherjee A, Chakrabarti J, Chakrabarti A, Banerjee T, Sarma A. Effect of 'Pan Masala' on the germ cells of male mice. Cancer Lett 1991;58:161-5. Bagchi M, Balmoori J, Bagchi D, Stohs SJ, Chakrabarti J, Das DK. Role of reactive oxygen species in the development of cytotoxicity with various forms of chewing tobacco and pan masala. Toxicology 2002;179:247-55. Mojidra BN, Archana K, Gautam AK, Verma Y, Lakkad BC, Kumar S. Evaluation of genotoxicity of pan masala employing chromosomal aberration and micronucleus assay in bone marrow cells of the mice. Toxicol Ind Health 2009;25:467-71. Bhisey RA, Ramchandani AG, D'Souza AV, Borges AM, Notani PN. Long-term carcinogenicity of pan masala in Swiss mice. Int J Cancer 1999;83:679-84. 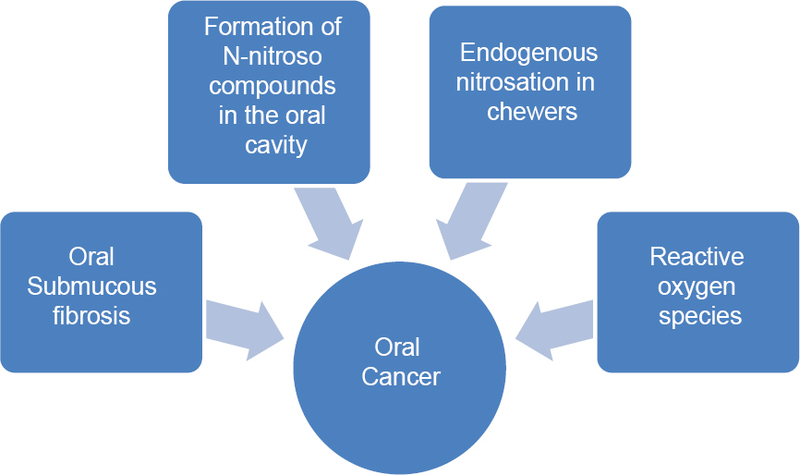 Yadav JS, Chadha P. Genotoxic studies in pan masala chewers: A high cancer risk group. Int J Hum Genet 2002;2:107-12. Ramchandani AG, D'Souza AV, Borges AM, Bhisey RA. Evaluation of carcinogenic/co-carcinogenic activity of a common chewing product, pan masala, in mouse skin, stomach and esophagus. Int J Cancer 1998;75:225-32. Patel RK, Trivedi AH, Jaju RJ, Adhvaryu SG, Balar DB. Ethanol potentiates the clastogenicity of pan masala – An in vitro experience. Carcinogenesis 1994;15:2017-21. Gupta PC, Ray CS. Epidemiology of betel quid usage. Ann Acad Med Singapore 2004;33 4 Suppl: 31-6. Pandya S, Chaudhary AK, Singh M, Singh M, Mehrotra R. Correlation of histopathological diagnosis with habits and clinical findings in oral submucous fibrosis. Head Neck Oncol 2009;1:10. Khrime RD, Mehra YN, Mann SB, Mehta SK, Chakraborti RN. Effect of instant preparation of betel nut (pan masala) on the oral mucosa of albino rats. Indian J Med Res 1991;94:119-24. Misra SP, Misra V, Dwivedi M, Gupta SC. Oesophageal subepithelial fibrosis: An extension of oral submucosal fibrosis. Postgrad Med J 1998;74:733-6. Nigam SK, Bhatt HV. Structural changes and gross pathology of gut and associated organs of mice on chronic exposure to pan masala plain and its blend (pan masala tobacco): A review and an experimental study. Euroasian J Hepato Gastroenterol 2012;2:94-7. Kumari S, Dutta A. Histochemical studies on the induced toxicity of pan masala on various organs of swiss mice and the protective effect of Elettariacardamom (L.) Maton. Ann Biol Res 2012;3:1919-22. Nigam SK, Bhatt HV. Effects of plain and blended Indian pan masala on murine liver. Euroasian J Hepato Gastroenterol 2011;1:27-9. Cimolai N, Cimolai T. Severe iron deficiency anemia and gastrointestinal dysfunction associated with ingestion of pan masala. J Diet Suppl 2008;5:305-9. Anuradha CD, Devi CS. Serum protein, ascorbic acid and iron and tissue collagen in oral submucous fibrosis – A preliminary study. Indian J Med Res 1993;98:147-51. Archana K, Gautam AK, Lakkad BC, Kumar S. In utero and lactation exposure of mice to pan masala: Effect on dams and pregnancy outcome. J Environ Pathol Toxicol Oncol 2011;30:71-81. Sharma AK, Gupta R, Gupta HP, Singh AK. Haemodynamic effects of pan masala in healthy volunteers. J Assoc Physicians India 2000;48:400-1. Rajwanshi P, Singh V, Gupta MK, Kumari V, Shrivastav R, Ramanamurthy M, et al. Studies on aluminium leaching from cookware in tea and coffee and estimation of aluminium content in toothpaste, baking powder and paan masala. Sci Total Environ 1997;193:243-9. Yadav AK, Kaushik CP, Haritash AK, Singh B, Raghuvanshi SP, Kansal A. Determination of exposure and probable ingestion of fluoride through tea, toothpaste, tobacco and pan masala. J Hazard Mater 2007;142:77-80. Srinivasan TN, Suresh TR, Jayaram V. Pan masala-A new substance of dependence. Indian J Psychiatry 1993;35:189. Patel RK, Trivedi AH, Roy SK, Bhatavdekar JM, Shah PM, Patel DD. Influence of alpha-tocopherol and ascorbic acid on pan masala induced genomic damage. An in vitro experiment. J Exp Clin Cancer Res 1998;17:419-24. Patel RK, Trivedi AH, Jaju RJ, Kukreti MS, Bhatavdekar JM, Shah PM, et al. Protection from pan masala induced genomic damage by beta-carotene and retinoic acid – An in vitro experience. Neoplasma 1998;45:169-75. Rajan G, Ramesh S, Sankaralingam S. Areca nut use in rural Tamil Nadu: A growing threat. Indian J Med Sci 2007;61:332-7. Sushma C, Sharang C. Pan masala advertisements are surrogate for tobacco products. Indian J Cancer 2005;42:94-8. Nair S, Schensul JJ, Bilgi S, Kadam V, D'Mello S, Donta B. Local responses to the Maharashtra gutka and pan masala ban: A report from Mumbai. Indian J Cancer 2012;49:443-7. Mishra GA, Gunjal SS, Pimple SA, Majmudar PV, Gupta SD, Shastri SS. Impact of 'gutkha and pan masala ban' in the state of Maharashtra on users and vendors. Indian J Cancer 2014;51:129-32.